Pityriasis rosea (PR) is a common benign cutaneous disorder of children and young adults. The etiology of this condition is still unknown. Despite the common occurrence, second episode of PR is noted only in 1-3% of the cases. Multiple recurrences (three or more episodes) are extremely uncommon and to the best of our knowledge, only few patients have been reported in the literature. Due to the benign nature of the disease, these recurrences may be either underestimated or unreported. Till date, there are no predisposing factors identified for the occurrence of these multiple episodes. We report a case of pityriasis rosea in an 11-years-old male with three episodes with review of the literature. Pityriasis rosea is an acute common self limiting cutaneous disorder of children and young adults. Pityriasis rosea (PR) is a common papulosquamous cutaneous disorder of unknown etiology. It is common in younger population and the lesions are benign and self limiting in nature. Recurrences are unpredictable and second episodes are reported between 1-3%. , Multiple recurrences (third and subsequent episodes) are extremely unknown and only five case reports involving seven patients have been reported in the past. ,,,, We report a case of PR in a boy with three episodes with review of the existing literature. 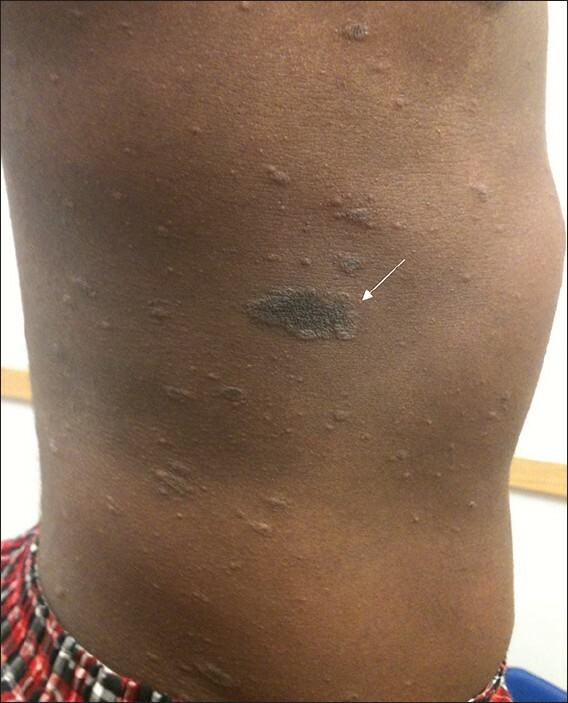 Our patient is an 11-year-old male who presented to the pediatric clinic with an itchy rash for three weeks duration. There was no preceding illness or immunizations. Patient did not have atopic diseases and the family history was not contributory. He denied intake of any medications prior to the onset of the rash. The primary lesion started on his trunk and was itchy. Mother thought it was a fungal infection and applied topical clotrimazole. For the itching, he was given diphenhydramine. A week later, he developed a generalized itchy rash mainly on his trunk (back, chest and abdomen). Few days later, he also had similar lesions on his proximal ascept of extremities. Mother reported that he had similar rash in the past. As the rash and itching did not improve, mother brought him to the pediatric clinic. On examination, he had a papulosquamous rash mainly on his trunk with a Christmas tree pattern [Figure 1]. The lesions were about 1-2 cm in diameter, scaly with raised margins. Herald patch was seen on the right side of the trunk which was oval in shape with a dimension of 4 × 2.5 cm [Figure 1]- indicated by white arrow]. Examination of the rest of the systems was within normal limits. Pityriasis rosea (PR) was diagnosed from the classical description of the lesions. Serological test for syphilis (RPR - rapid plasma reagin) was negative. Fungal culture and the microscopy with KOH from the skin scrapings were negative. Patient was treated symptomatically with oral diphenhydramine and topical moisturizers. All the lesions disappeared in three weeks period with mild postinflammatory hyperpigmentation. Review of the past medical records revealed that he was diagnosed with PR twice in the past. The initial presentation occurred at five years of age. There was no documentation about the herald patch. The lesions were mainly noticed on the trunk (chest, back and groin) and some on the face. No preceding illness was documented. Symptomatic treatment (diphenhydramine and moisturizers) was advised. The entire skin lesions disappeared in four weeks and patient had mild post inflammatory hyperpigmentation. The second episode was documented at nine years of age without any prior illness. Herald patch was documented at the same site on the right side of the trunk as in the current presentation. The lesions were noticed in the trunk and all the lesions disappeared in four weeks. According to the mother, the severity and course of these three episodes were almost similar. Currently, one year after the third episode, mother reported no further recurrences of PR. Despite the common occurrence of PR, recurrence of this condition is rare. Various studies quote a recurrence rate between 1-3% for the second episodes. , Multiple recurrences in PR (third and subsequent episodes) are considered extremely rare and one of the atypical presentations. We did Medline search in August, 2012 using the terms "recurrences in pityriasis or "relapses in pityriasis rosea" which yielded 15 articles. All the articles and their references in English were carefully reviewed and further relevant articles were included. We found only five pertinent case reports involving seven patients with multiple recurrences (three or more recurrences) which are summarized in the [Table 1]. ,,,, Bjomberg and Hellgren cited two more patients with three episodes of PR. These two articles (published in the years 1936 and 1941) could not be found in Medline and were not included in the [Table 1]. To the best of our knowledge, the maximum number of episodes reported so far is five. ,, However Halkier-Sorensen did mention about a patient with seven recurrences in their discussion. The etiology for multiple recurrences is not clearly known and till now there is no precipitating or predisposing factors identified. In some studies, it has been postulated that the interactions between host and the viruses (HHV 6 and 7) may be reason for the recurrences. The primary lesion or the herald patch may be seen at the same site as in our patient or in a different site  or may not be seen in the recurrences. The primary occurrence and the recurrences have been reported in all seasons. Singh et al. reported both the primary lesion and the recurrences in winter whereas Halkier-Sorensen  documented all the occurrences (both primary and the recurrent lesions) in spring. In our patient, the initial infection occurred in summer and the recurrences occurred in winter and summer. As the rash of secondary syphilis closely mimics PR, serological testing for syphilis must be done in all cases of recurrent PR. Our case is unique because, among the previously reported cases, only one case has been documented in the pediatric age group by Zawar et al. They reported an atypical variant called pityriasis rosea circinata et marginata of Vidal (PRV). In the patient described by them, the herald patch was not reported in recurrent lesions and the recurrent lesions were of reduced severity. In our patient, the recurrences were similar in severity to the primary lesion. In the recurrent PR, it is important that the same physician, preferably a dermatologist, to examine and document the skin lesions of the patient. In our patient, all the episodes are recorded by different pediatricians. We agree that this is a limitation in this case as the other conditions mimicking PR needs to be ruled out preferably by a dermatologist. Also a skin biopsy was not done in our case, which will help in confirming the diagnosis of all atypical cases of PR. We believe that the true incidence for the multiple recurrences may be under estimated as patients can seek advice from different physicians or from other hospitals. Also the patients who were already informed about the benign nature of the condition and the possibility of recurrences may not seek medical care and may continue the symptomatic treatment. We conclude that in view of the extreme rarity, the diagnosis of multiple recurrences in pityriasis rosea may be potentially delayed or even may be misdiagnosed. We emphasize the readers that a high index of suspicion is required for this rare possibility to avoid diagnostic dilemma. 1. Bjomberg A, Hellgren L. Pityriasis rosea. A statistical, clinical, and laboratory investigation of 826 patients and matched healthy controls. Acta Derm Venereol Suppl (Stockh) 1962;42:1-68. 2. Chuang TY, Ilstrup DM, Perry Ho, Kurland LT. Pityriasis rosea in Rochester, Minnesota: 1969 to 1978. J Am Acad Dermatol 1982;7:80-9. 3. Halkier-Sorensen L. Recurrent pityriasis rosea: New episodes every year for five years. A case report. Acta Derm Venereol 1990;70:179-80. 4. Singh SK, Singh S, Pandey SS. Recurrent pityriasis rosea. Indian J Dermatol Venereol Leprol 1998;64:237. 5. Zawar V, Kumar R. Multiple recurrences of pityriasis rosea of Vidal: A novel presentation. Clin Exp Dermatol 2009:34:e114-6. 6. Drago F, Broccolo F, Rebora A. Pityriasis rosea: An update with a critical appraisal of its possible herpesviral etiology. J Am Acad Dermatol 2009;61:303-8. 7. Chuh A, Zawar V, Lee A. Atypical presentations of pityriasis rosea: Case presentations. J Eur Acad Dermatol Venereol 2005;19:120-6. Multiple recurrences in pityriasis rosea is extremely uncommon and etiology of these recurrences is unknown. Self limiting nature of this condition and underreporting may also account for this extreme rarity.